10:04 p.m. - East River Rd. - First aid - MVA with no injuries, referred to Sheriff's Dept. 8:44 p.m. - Marlin Rd. - Fire call - structure fire, extinguished by Fire Co.
10:46 p.m. - Bedell Rd. - Fire call - report of wires down, no hazard, Niagara Mohawk was notified. 3:07 p.m. - Baseline Rd. - Fire call - report of gas spill, contained, cleaned up by Fire Co.
6:25 p.m. - 2nd Ave. - First aid - patient evaluated by squad, referred to private physician, Erie Co. Sheriff's Dept. 8:26 a.m. - Grand Island Blvd. - First aid - patient evaluated by squad, referred to private physician, Erie County Sheriff's Dept. 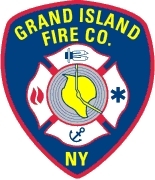 11:08 a.m. - Schwegler Dr. - Fire call - investigate electrical malfunction, hazard removed by Fire Co.
4:14 p.m. - Thruway South - Fire call - car fire, extinguished by Fire Co.
7:49 p.m. - Schutt Ct. - Fire call - structure fire, extinguished by Fire Co.
10:55 a.m. - Fourth St. - First aid - patient evaluated by squad, referred to private physician, Erie Co. Sheriff's Dept. 7:32 a.m. - Stony Point - Fire call - telephone junction box damaged by vehicle, no injury or fire, referred to phone co.
11:24 p.m. - Baseline Rd. - Fire call - Carbon monoxide detector activation. Meter reading determined hazardous levels. Source found to be gas fireplace that was off upon arrival. Ventilated. 6:47 a.m. - Twn. of Ton. - Multiple aid for fast team at Ocello on Sawyer Ave.